Three Billboards is one of those meandering movies whose story takes you to unexpected places. The trailers really don’t give away what’s going on in this amazing little gem of a film, a film which will break your heart while making you laugh out loud. At the centre of this story is a tour de force performance by the incredible Frances McDormand, here out doing her Oscar winning Fargo role. Yes she is that good. But she is just the centre piece of a tremendous cast including Sam Rockwell also giving one of his best performances (which is saying quite a lot). I was often amazed at just how rich their performances were, how layered and complex. But a lot of that has to do with the magnificent screenplay, a script which takes its time to get us to know who we are dealing with, and allows the story to go where it needs to without fitting any formula or meeting any expectations. Instead Three Billboards is the kind of story that is hard to explain and better just followed, allowing it to take you on its remarkable journey. Again and again it defied my expectations in a way that was completely satisfying. Three billboards is being sold as a comedy and it is one, but it is gutwrenching too. They don’t let on just how powerful a story this is, and how in only two hours, the film makes such a complete, nuanced odyssey which, as I said, goes far beyond ones expectations. 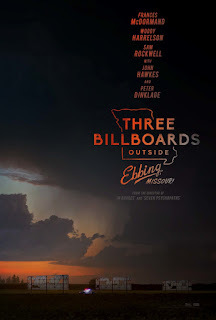 Martin McDonagh very unassuming tells his story of lost flawed people doing the best and worst that they can in the lovely and compelling Three Billboards Outside Ebbing, Missouri.